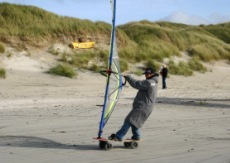 On day 2 of the UK Tiree Wave Classic the wind was light so a TurfDog competition was held for the competitors. An emphasis on fun with both slalom and freestyle made for a afternoon of great action in the sun. The location was Crossapol beach and 16 competitors took part. Many thanks to Louise Emery from Boardseeker for running the competition and Steve King for judging the freestyle.